Last week astronauts hooked up the last of several solar panel wings bringing the orbital outpost of the International Space Station. These very delicate panels were built by Boeing for NASA and contain many solar cells that collect the sun's light.These last solar wings took the two spacewalkers six hours to install with reportedly a few shaky moments to keep them on their moon boot snug toes. But it was well worth the eco space trip. 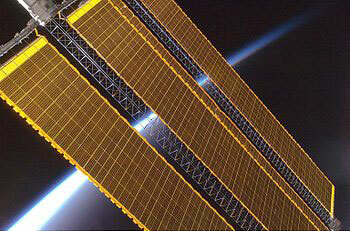 The new solar panels will bring the space station to full power enabling it to generate 124 kilowatts of electricity. The extra power support will boost the project by increasing the space team from six to twelve astronauts, meaning more science experiments to be done. According to Reuters World Environment News station commander Michael Finck said upon the astronauts solar mission return: "Welcome back aboard the space station. It's a lot bigger than when you left". Nice quip for a space walking fellow wouldn't you say? The International Space Station is a $100 billion project involving 16 different nations, has been underway for nearly a decade and is expected to be finished next year.